Aranyon Pass is a sinister haunted canyon cutting through the Boethiah's Spine. For most of its course, it runs north-south, except for the southernmost section, which heads northwest-southeast. In the north, the canyon starts just east of Sarvanni, and the southern end emerges from the mountains east and a little north of Ranyon-ruhn, close to Shasharanit cavern. It is large enough to possess its own weather system. In the past, an additional tunnel led west from Ashamul into the pass, but that has mostly collapsed. Both ends of the pass are marked by "Danger" signs, and with good reason. It is home to a number of undead, of types not found anywhere else in Morrowind. They can usually be found close to the entrance to Erushara Ancestral Tomb, which lies roughly two thirds of the way to the south. Although dangerous, the canyon is often used as a shortcut between Ranyon-ruhn and Tel Ouada. The only other road route is to head along the coast, past the Boethian Mountains Lighthouse then past Ashamul. The journey is cut in half by heading through the pass. People living nearby regard the pass with a degree of horror, and will tell you that "I feel shivers everytime I'm near it. If you know what's good for you, you'll stay away from there." and "A spooky place. Sometime we hear ghostly voices and faint screams coming from there." A list of places found in the Aranyon Pass region. 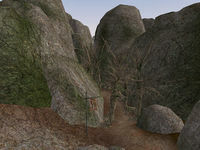 Dunada-Nammu — A burial chamber north of Ranyon-ruhn inhabited by undead. Erushara Ancestral Tomb — A medium-sized tomb halfway along Aranyon Pass due south of Sarvanni, inhabited by undead. This page was last modified on 27 February 2019, at 17:09.